Our PTFE Lined Composite Chemical Transfer has the same handling characteristics as our other composite transfer hoses, but this hose incorporates PTFE films for more durability when handling aggressive chemicals (refer to chemical charts). Its PTFE composition also permits higher operating temperatures. Our NL4380 Marinemaster SG Dock hose is typically used for chemicals while the NL4385 Marinemaster GG Dock hose is typically used for high temperature petroleum unloading. 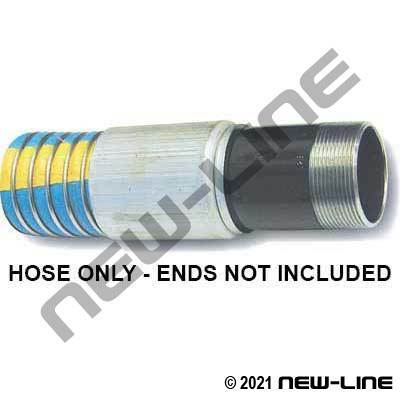 Typical Fittings: Swage or C10-CS crimp fittings specifically designed for composite hose. Construction: All have multiple layers of PTFE Type 3 fabric & films. Temperature Range: -30°C (-22°F) to +100°C (212°F) or higher depending on product being conveyed. Detail Comments: NL4275 SG Series - Interior: 316SS wire helix. Exterior: Light blue (no stripe) with a galvanized steel wire. NL4280 SS Series - Interior: 316SS wire helix. Exterior: Light blue (yellow stripe) with a 316SS wire. NL4380 SG Series - Interior: 316SS wire helix. Exterior: Black (white stripe) with a galvanized steel wire. NL4385 GG Series - Interior: Galvanized steel helix. Exterior: Black (no stripe) with a galvanized steel wire.